Oct. 2, 2008: Scientists using NASA's RHESSI spacecraft have measured the roundness of the sun with unprecedented precision, and they find that it is not a perfect sphere. During years of high solar activity the sun develops a thin "cantaloupe skin" that significantly increases its apparent oblateness. Their results appear the Oct. 2nd edition of Science Express. "The sun is the biggest and smoothest natural object in the solar system, perfect at the 0.001% level because of its extremely strong gravity," says study co-author Hugh Hudson of UC Berkeley. "Measuring its exact shape is no easy task." The team did it by analyzing data from the Reuven Ramaty High-Energy Solar Spectroscopic Imager, RHESSI for short, an x-ray/gamma-ray space telescope launched in 2002 on a mission to study solar flares. Although RHESSI was never intended to measure the roundness of the sun, it has turned out ideal for the purpose. RHESSI observes the solar disk through a narrow slit and spins at 15 rpm. The spacecraft's rapid rotation and high data sampling rate (necessary to catch fast solar flares) make it possible for investigators to trace the shape of the sun with systematic errors much less than any previous study. Their technique is particularly sensitive to small differences in polar vs. equatorial diameter or "oblateness." "We have found that the surface of the sun has rough structure: bright ridges arranged in a network pattern, as on the surface of a cantaloupe but much more subtle," describes Hudson. During active phases of the solar cycle, these ridges emerge around the sun's equator, brightening and fattening the "stellar waist." At the time of RHESSI's measurements in 2004, ridges increased the sun's apparent equatorial radius by an angle of 10.77 +- 0.44 milli-arcseconds, or about the same as the width of a human hair viewed one mile away. "That may sound like a very small angle, but it is in fact significant," says Alexei Pevtsov, RHESSI Program Scientist at NASA Headquarters. Tiny departures from perfect roundness can, for example, affect the sun's gravitational pull on Mercury and skew tests of Einstein's theory of relativity that depend on careful measurements of the inner planet's orbit. Small bulges are also telltale signs of hidden motions inside the sun. For instance, if the sun had a rapidly rotating core left over from early stages of star formation, and if that core were tilted with respect to its outer layers, the result would be surface bulging. "RHESSI's precision measurements place severe constraints on any such models." The "cantaloupe ridges" are magnetic in nature. They outline giant, bubbling convection cells on the surface of the sun called "supergranules." Supergranules are like bubbles in a pot of boiling water amplified to the scale of a star; on the sun they measure some 30,000 km across (twice as wide as Earth) and are made of seething hot magnetized plasma. Magnetic fields at the center of these bubbles are swept out to the edge where they form ridges of magnetism. The ridges are most prominent during years around Solar Max when the sun's inner dynamo "revs up" to produce the strongest magnetic fields. 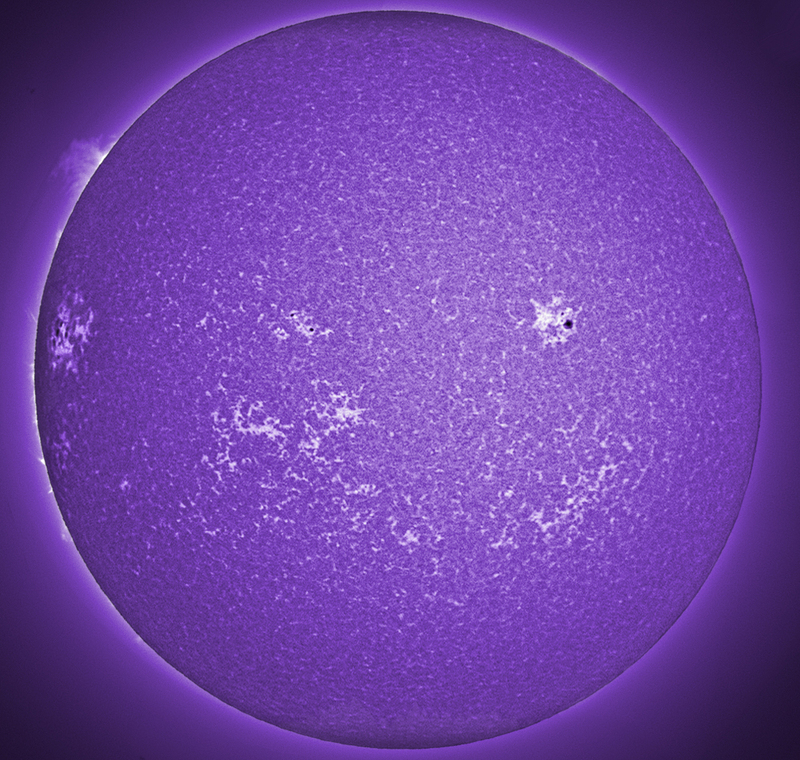 Solar physicists have known about supergranules and the magnetic network they produce for many years, but only now has RHESSI revealed their unexpected connection to the sun's oblateness. "When we subtract the effect of the magnetic network, we get a 'true' measure of the sun's shape resulting from gravitational forces and motions alone," says Hudson. "The corrected oblateness of the non-magnetic sun is 8.01 +- 0.14 milli-arcseconds, near the value expected from simple rotation." "These results have far ranging implications for solar physics and theories of gravity," comments solar physicist David Hathaway of the NASA Marshall Space Flight Center. "They indicate that the core of the sun cannot be rotating much more rapidly than the surface, and that the sun's oblateness is too small to change the orbit of Mercury outside the bounds of Einstein's General Theory of Relativity." Further analysis of RHESSI oblateness data could also help researchers detect a long-sought type of seismic wave echoing through the interior of the sun: gravitational oscillations or "g-modes." The ability to monitor g-modes would open a new frontier in solar physicsâ€”the study of the sun's internal core. "All of this," marvels Hathaway, "comes from clever use of data from a satellite designed for something entirely different. Congratulations to the RHESSI team!" The paper reporting these results, "A large excess in apparent solar oblateness due to surface magnetism," was authored by Martin Fivian, Hugh Hudson, Robert Lin and Jabran Zahid, and appears in the Oct. 2nd issue of Science Express.